Loculus Collective presents their third publication at an evening of solo performances by collective members and featured guests. Performances by Katie Aylward, Katherine Adler, Ryan Mihaly + Stephanie Jacco, Aliza Persing, Liz Kleisner, Madison Palffy, Hayley-Jane Blackstone, Olana Flynn, and Suz Evans. Loculus Quarterly, Volume I, Issue III, House of One, features writing and art by collective members as well as two guest writers Andrew Forsthoefel and Nick Maione. Loculus is a performance collective based in Western Massachusetts. 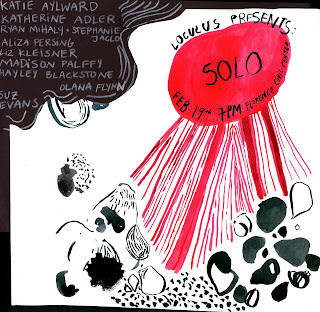 Loculus performs locally, often in collaboration with DIY musicians and artists in non-traditional performance spaces. In addition to performing Loculus self-publishes a quarterly journal. Loculus is Hayley-Jane Blackstone, Olana Flynn, Stephanie Jacco, Molly McBride, Madison Palffy, and Aliza Persing.